Perfectly preserved, live active Kefir. 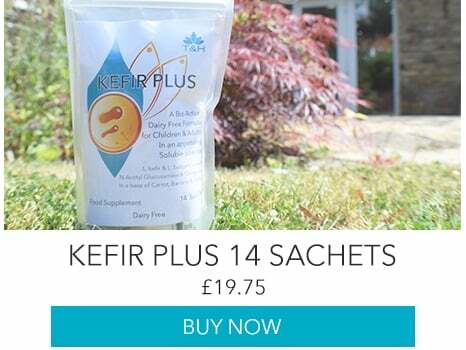 Our Kefir Plus powder can survive and thrive in the gut better than similar milk-based products, as the bacteria strains have been isolated and purified to be stable in the acidic environment of the digestive system. It’s dairy-free and recommended by Dr Michael Mosley on BBC2's Trust Me, I'm a Doctor. 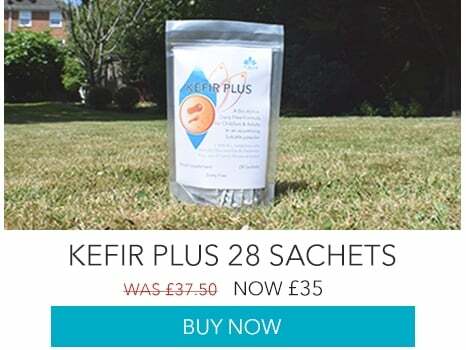 £10 for 7 Sachets - Over 25% off! 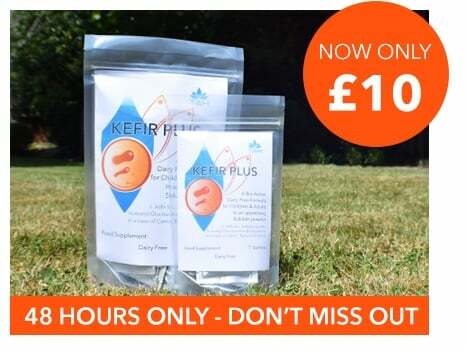 Kefir Plus is a freeze-dried powder that can be added to smoothies, juice, water or milk and drunk straight away. It is not a starter culture, it is made up of 'good' gut bacteria that have already been cultured and preserved. Kefir Plus is a unique powder, with 2 billion bacteria that become live and active when they reach the gut. This means that the bacteria are not destroyed by acids in the stomach, and continue their journey through the gut for maximum therapeutic benefit. However, the gut is responsible for far more than just our digestion. Dr. Michael Mosley’s recent research has shown that good gut health can improve your mood and energy levels - it’s being called the second brain. Kefir plays a key role in promoting a healthy gut ecology within your body, which will help you to feel your best, both physically and emotionally. Kefir Plus is dairy-free which means that those who are lactose intolerant are able to enjoy the taste and the benefits. In addition, the Kefir will support the gut ecology in a way that reduces intolerance, and will reduce lactose or other food intolerances. Aside from being a great tasting banana and carrot flavour, our Kefir Plus is a research-based supplement which combines L. bulgaricus and L. kefir. These both play a beneficial role in helping heal and support the gut, increase immunity, reduce pH levels, and regulate serum lipid levels. The bacteria has been standardised and purified to survive the acidic environment of the stomach, as generally most probiotics available in the market are not stable in the acidic environment of the digestive system. The probiotics are able to transit to the colon and help alleviate symptoms of chronic constipation, establish good bacteria after taking antibiotics, and have benefits for H. Pylori and IBS sufferers. Plus the ‘Glutamine’ and ‘N Acetyl Glucosamine’ helps to reduce gut inflammation. These two supplements work alongside the Kefir to heal the gut wall, reduce inflammation and boost your immune system. L. Glutamine is the most common amino acid found in your muscles, and having the correct levels will lead to more energy and allow your body to recover and repair more quickly. These supplements also work to improve skin health, especially for conditions like eczema, rosacea, and acne. Even the banana and carrot flavour contain pectin which will help to break down food in the colon. How should you take your Kefir Plus? We recommend taking one sachet in a 150ml glass of water, juice, smoothie or milk after a meal in the evening, as this will improve digestion and absorption of nutrients after food intake. The taste is a delicious natural banana and carrot flavour, which is added to improve the breakdown of cellulose food material. Mixing with hot drinks or hot water is not recommended. Do not mix with honey, sugar or agave or maple syrup. Check out our basic Kefir Breakfast Smoothie recipe to the left! The powder contains a minimum of 1 billion cells of both L. kefir and L. bulgaricus as live active bacteria: we like our customers to know exactly what they are taking. 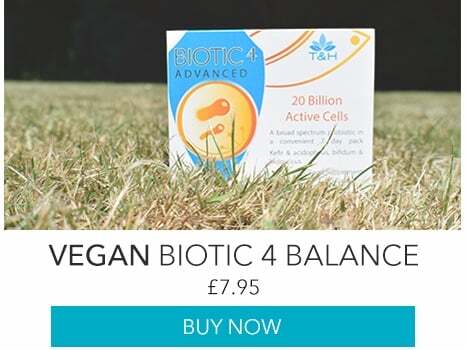 These were specially chosen to improve your health the most - research shows that these transitory lactic bacteria contribute to good overall health and longevity in the Eastern European populations. L.bulgaricus is proteolytic. It supports digestion and is recommended for overall support of the friendly bacteria, digestibility of milk products and other proteins, and immune enhancement. L.kefir can be found in many different environments and in fermented foods such as sauerkraut and pickles, also fermented milk and milk products. L.kefir mediates adhesion and provides the ability to be transferred to non-adhesive lactic acid bacteria. Want to know more about Kefir? Kefir is traditionally in the form of a fermented drink, made and consumed for centuries in the Caucasus Mountains. It was originally made with goat’s or cow’s milk, but may also be made with coconut milk. It is made by adding kefir “grains” to the liquid and leaving at room temperature to ferment. During this time, healthy bacteria proliferate, changing the taste of the milk to a tangy, yeasty flavor. Kefir grains contain around 30 strains of bacteria and yeasts which include Lactobacillus Kefir, Lactobacillus acidophilus, Candida species and Lactobacillus bulgaricus. It modifies the gut ecology, and helps break down cellulose and starches in the diet, making them more digestible. Recent experiments in Britain have shown that regular drinking of kefir may have more benefits than expensive probiotic drinks (which often contain sugar to make them more palatable). One of the benefits seen in volunteers who consumed kefir for four weeks, was an increase in lactobacillus – a family of friendly bacteria, known to help create balance in the gut, which may benefit those with lactose intolerance or enteric infection causing traveller’s diarrhoea. As well as this, tolerance to some foods may be improved with the daily consumption of transitory lactic bacteria and the availability of a more accessible source of nutrition to selectively feed the adherence strains of lactic bacteria can also be enhanced by the digestive activity provided by L bulgaricus and L kefir. The activity of phyto-oestrogens such as lignans may also be enhanced through the interaction of these transient bacteria. I have been stressed over many years with Acne and not been able to go out or socially be active. After taking Kefir for a week I felt the redness and inflammation on certain spots went down and I feel more happy with my skin, this product has made a HUGE difference to my life. After taking these my rash on my body has gone down and digestive system is working better with reduced bloating. Thank you Kefir! 5 stars! I take Kefir plus daily to support my skin and my digestive system, I am very happy with the product. I have taken Kefir plus to suppport my immune system and digestive system while being on antibiotics, it was recommended by my doctor that I take some kind of probiotics and after a lot of reading, kefir seemed like a great option. It's made a huge difference to my energy levels and overall wellbeing, and tastes excellent :) Great job guys! I want to say a big thank you to Nina at TnH, Kefir has helped so much with my digestive system and bowel movements. I've recommended it to many friends since then and I've had a lot of positive feedback from them too.